New to hamsters? Probably the first question on your mind is how to properly feed your new furry friend. We’ve put together this guide to help beginners provide the right nutrition for their pet hamsters. Feed your hamster a good quality balanced commercial diet that’s formulated specifically for hamsters. Add a balanced mix of fresh foods in controlled amounts. We’ll break all of this down so you know exactly what to look for when picking out food and treats for your hamster. Keep reading to get everything you need to know how to feed hamsters right. What are the nutritional requirements of hamsters? What kind of hamster food should you buy? How often to feed your hamster? How to supplement your hamster’s diet with fresh food? The phrase “you are what you eat” covers hamsters as well. In order to maintain good health, a hamster needs to get a well-balanced diet which includes all of the nutrients it needs, in the right amounts. With good-quality nutritious food, your hamster will thrive and can live a longer, happier, and healthier life. So, if you truly want what’s best for your pet, you need to start by feeding him or her right. In the wild, hamsters can forage for a wide variety of fresh greens and pick out exactly what their body needs. As your pet, you are the one and only source of food for your hamster. That means you’re responsible for providing the variety and nutritional balance he or she is craving. With that in mind, let’s see what is it exactly that a hamster needs to eat. Now that you understand the importance of feeding your hamster the right type of food, let’s take a look at the basic building blocks that go into good hamster nutrition defined by science. And don’t let the percentages outlined below deter you. Remember that all you need to worry about is providing your hamster with high-quality species-appropriate commercial food, and then supplementing with healthy treats in small amounts. More on that later. First, let’s look at the main nutrients, starting with the three macronutrients: Protein, fats, and carbohydrates, and moving on to minerals and vitamins. Protein is made up of amino acids and is responsible for a myriad of processes throughout the body. Proteins are the building blocks of tissue, so they’re essential for growth too. That’s why pregnant females hamster pups need more protein. There are not many studies done on the protein requirements of adult hamsters. The information gathered so far suggests that 14%-20% protein is a good range for most hamsters. For pregnant females and growing hamster pups, the general recommendation is 18% protein content. We do know that the quality of protein matters too. Studies have shown that wheat-based protein is not enough for hamsters. They need more varied sources for protein in their diet. Fats are made up of lipids, and also have a number of important roles in the body’s functions. It’s also used for energy, and so having the right amount is important to your hamster’s health. As you can imagine, too much fat can cause weight gain. However, too little fat can lead to poor overall health. Studies seem to show that hamsters do well with a range of 3% to 9% fat in their diet, with the optimal number for growth being just above 5%. Carbs are the most common source of energy in your hamster’s diet. The type of carbs matters more than the exact amount. Avoid processed sugars in hamster food and limit overall sugar intake. Lactose and fructose, in particular, should be limited in your hammy’s diet. Research shows that too much fructose and lactose can kill a hamster, whereas a similar amount of sucrose will not. So, the type of sugar matters too. Just like humans, hamsters need a variety of minerals and vitamins in their diet in order to remain healthy. There are many studies that show how hamsters can suffer from deficiencies in various minerals and vitamins. 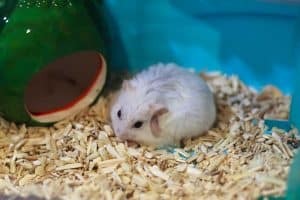 However, all you need to do to make sure your hamster is getting enough of these is to stick to the basic rules of feeding hamsters: Basing 90%-95% of the diet on a high-quality hamster-specific commercial formula, and supplementing with fresh vegetables and a small amount of nuts and fruit. Now that we know that hamster nutrition needs to include a good balance of carbs, protein, fat, vitamins and minerals – what’s next? How do you implement that when you’re at the store or shopping for hamster food online? Here are a few simple rules that will help you pick the right food for your precious little furry friend. 1. Look for food that says “hamsters” specifically on the package. Hamsters are not rats, neither are they guinea pigs. Their digestive system is actually a bit different and they thrive on a slightly different mix of nutrients. Some foods may be varied enough to cover the needs of more than one type of rodent pet – but not all. When shopping, make sure the bag specifies hamsters. A mix that’s formulated specifically for hamsters, and only hamsters, is the way to go. When looking at the ingredient list, you should first be looking for the number of whole foods included in the food. This is anything that is minimally processed. This is a good example of having repeated ingredients. Manufacturers often do this because ingredients are listed by quantity. By splitting ingredients, they can have less desirable ones appear further down on the list when people stop reading. Look for the label on the pet food bag to find out the percentage of protein, fats, carbs, and fiber that are included in the mix. And again, your best bet is to look for food that is specifically formulated for hamsters. When looking at types of hamster foods, there are two basic types: lab blocks and seed mixes. We’re going to quickly define them and go over some pros and cons of each so you have a better understanding of what’s best for you and your hamster. Lab blocks are any food that is made up only of pellets. These pellets could be small, or larger, which is where the “block” part of their name comes from. The other part of the name comes from the fact that these are often used in laboratory settings. Overall, lab blocks are a great way to guarantee that your hamster is getting proper nutrition since he can’t pick and choose what he wants. As with seed mixes, you’ll want to look for lab blocks that include a variety of ingredients. Also, although they’re more expensive per pound, they’re also more packed with nutrients and there’s little waste, so many owners find they save money by using them. A seed mix can include a mixture of pellets, seeds, and other dried whole food ingredients. Essentially, a food is considered a seed mix as long as it has anything other than pellets. Many hamsters prefer seed mixes because of the variety. While seed mixes have their benefits, the biggest concern is selective eating. When a hamster is picking and choosing what she eats from her food, she’s not getting the guaranteed analysis. This can cause problems because she may not be getting enough protein, fat, or fiber. As you can imagine, trying to decide between lab blocks and seed mixtures is difficult. What makes it even more difficult is the fact that there’s no one food that has the right levels of protein, fat, and fiber. For that reason, many hamster owners use a mixture of lab blocks and seed mixes to create the ideal food for their pet. We’re going to give you a recipe to create the best possible mixture, then let you know how you can create your own mix and calculate the new guaranteed analysis. It’s essential to start with high-quality foods whether you’re trying food mixing or picking just one food. Even mixing can’t fix a quality problem. 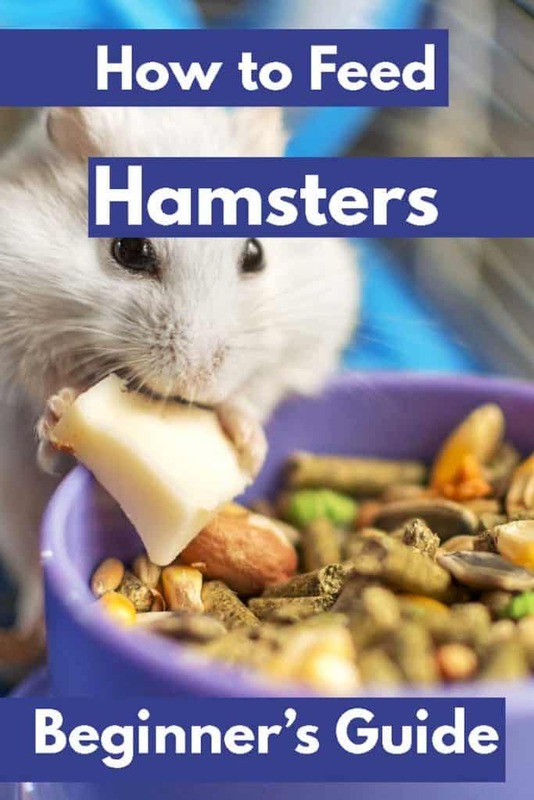 We’ve gathered a few samples of the highest quality foods on the market that you can use to create your own hamster mix if you don’t want to follow our recipe or need to tweak it to meet the needs of your individual hamster. SunSeed Critter Cubes are lab blocks that are great for mixing with a seed mix because of their high protein content. Another lab block food, Kaytee Healthy Forti-Diet Pro-Health can work well with certain seed mixes. The first seed mixture on our list, Vitakraft Natural High-Diversity Formula delivers a wide variety of ingredients with no added sugars. Burgess Supahamster Dwarf Hamster Harvest is considered a great choice for dwarf hamsters. It has a good variety of ingredients including some animal-based protein, and is all-natural with no added sugars. Last but certainly not least on our list is Brown’s Tropical Carnival Natural Gourmet Food. It has no added processed sugars but offers several unique ingredients including strawberry, sweet potato, and pineapple, giving it variety. 3. How much and often should you feed your hamster? Hamsters need to eat food throughout their waking hours, to satisfy their high rate of metabolism. Researchers established that wild hamsters eat at 2-hour intervals throughout the day. They forage for food and use their famous pouches to carry it back to their burrows. That’s where they store the food to be eaten later, whenever they get hungry. Which means you should make sure your hamster has a good supply of food and it’s ok if he or she stuffs her pouches and carries some back to the nest. That’s perfectly natural hamster behavior! Provide your hamster with food as per the quantities detailed on that quality pet food you bought. Don’t try to limit the amount beyond that, and allow your hamster the freedom to store the food for later use. Hamsters usually only eat between 1 and 2 tablespoons of food per day (depending on the size of the hamster). If given more than that, you may see it disappear from the food bowl, but it’s likely going into storage rather than being eaten. You should only give your hamster the amount they need for the day. This will prevent them from storing too much which isn’t being eaten. If you find that your hamster has a large amount of food they’re storing, you can cut back on the amount you’re feeding them. Start by cutting back by ½ a tablespoon each day. If they only have a few bits of food stored after a few days, that’s a good amount to keep them at. To reach optimal nutritional levels through more variety. To provide extra variety in your pet’s life. Read here more on how to fight boredom in hamsters. The key here is to keep supplementation just that – a small addition. In essence, these are “treats” and as such should be offered in very small amounts. At least 90% of your hammy’s diet should be made of a high-quality hamster-appropriate commercial food. The rest can be fresh foods, but even then, limit access to fruit, meat, and a few other ingredients. This is where we encourage you to also check out our guide to foods that are dangerous for hamsters. Some of these foods should be avoided entirely, while others may be given in very small amounts. Even with foods that are totally safe, follow the guidelines in each section and be careful to not feed more than what’s recommended. These foods you can feed on a daily basis as part of their regular food. You may notice that many of these are already in commercial foods. This is because they’re safe to be fed on a daily basis. To determine how much to give your hamster, first figure out how much commercial feed you’re giving your pet. For every tablespoon of commercial feed, you can give ½ teaspoon of these grains. This is the total combination, so don’t give ½ teaspoon of each! Some small seeds are also safe to give on a daily basis and in addition to the ½ teaspoon of the other foods in the previous section. You can safely feed the full amount of each of these seeds to your hamster every day. So, he can have 7 chia seeds, 7 flaxseeds, 1 safflower seed, and 1 sunflower seed all in one day. Because all seeds are different sizes, we’re including the amount of each type of seed that can be fed after it. There are a few other seeds that are safe to give you your hamster. However, these should only be given 2-3 times per week, and only one at a time. The reason for that is their relatively high-fat content. For example, you can give 1 pumpkin seed on Monday, a soy nut on Wednesday, and a squash seed on Saturday. However, you can’t give all three of those each of those days. With these vegetables, you can feed between ½ and 1 teaspoon to your hamster every 1-2 days. Keep in mind that this amount is the total of all veggies you’re feeding them that day, so if you’re feeding two different vegetables in one day, it should still only be ½ to 1 teaspoon in total. These next vegetables are only safe in small quantities and when given rarely. You can skip these completely if you’re worried about giving too much. But if you do give these to your hamster, you should never give more than ¼ of a teaspoon once per week. The reason these are limited mostly has to do with their high water content which can give hamsters diarrhea. Although many of these are technically vegetables, because they’re a different category, they can be fed in addition to the other vegetables listed above. The total amount that can be fed from this list is between ½ and 1 teaspoon every 1 to 2 days. Once again, that’s the total if you’re feeding different amounts. If you’re worried about how to measure this amount when feeding leaves, a 1-inch by 1-inch piece is about 1 teaspoon. Because they’re high in sugar and water content, fruits should be feed less often and only in very small quantities to hamsters. For the ones on this first list, you should only give ¼ teaspoon once or twice per week in total. Also, as a general rule, all seeds should be removed from fruits before feeding them to your hamster. Many fruit seeds and pits contain toxins in them that can kill your hamster. Apple seeds, grape seeds, cherry pits, peach pits, and plum pits are particularly dangerous for hamsters. Similar to fruits, berries should be limited because of their high sugar and water content. However, these are safer in slightly larger quantities and have different feeding recommendations. The seeds are also safe, so no need to worry about removing them in advance. Although you should limit feeding berries to once or twice a week, you can feed different amounts. We added the amount to give your hamster after each berry listed. Nuts are high in protein and fat, so while they’re good for your hamster, it’s only in small quantities. You should never feed your hamster more than 4 nuts in a month. So, you may want to get a small stash of different types of nuts and feed one per week. It’s also important to keep in mind that nuts should always be unsalted and unflavored as these additions are harmful to your hamster. Avoid peanuts though. They can sometimes contain contaminants that can be lethal for a hamster, even in small amounts. Wild hamsters are omnivores and include small amounts of bugs in their diets. For that reason, you can also provide some of this for your pet. The most natural source of animal protein for hamsters are insects that you can purchase at your local pet shop. You can feed these to your hamster every 1-2 days. What about other types of meat? Generally, these are not part of the natural hamster diet and are best avoided. Beef especially has high-fat contents which are unhealthy for hamsters. If you must, you can feed your hamster these meats up to ¼ teaspoon 1-2 times per month. Meats fed to hamsters must be unseasoned and thoroughly cooked. Boiling and baking are both acceptable ways to cook meat for hamsters. Here are some other sources of animal protein for your hamster. These have different serving amounts and frequencies which will be noted next to each item. Here are a few more things you can feed your hamster to provide them with some extra special food and give them more variety in their diet. The amount and frequency will be with each individual item because they vary. We’ve mentioned a few already, but there are many other foods you should never give a hamster. Some things are toxic specifically to hamsters or to other animals, and other things are simply unhealthy for them. 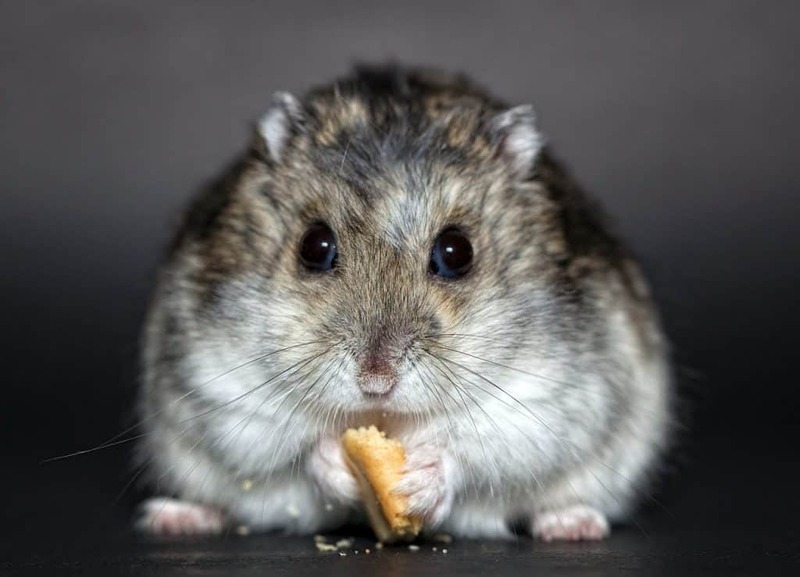 Rather than listing them all here, we created a post just for dangerous foods for hamsters. You can check it out here. We understand if all this information was a big overwhelming. So, here’s a quick summary of the most important things to keep in mind when feeding hamsters. Stick to quality hamster food. A mix of high-quality lab blocks (pellets) and a good seed mix. There are also many other foods you can add to your hamster’s diet. These should be fed in limited quantities and only after you’ve made sure they’re getting everything they need from their regular food. Not all foods are safe for hamsters, so always check our list before feeding your hamster anything new. If you’re ready to learn more about hamster care, you can here! We’ve got tons of articles that will help you with anything you may need to make sure your hamster is happy, healthy, and thriving. Previous PostHow to Stop My Hamster From Biting Me?